Looking at the Jet Pack, the new armour ability for Halo Reach, I'm wondering how 'in the real world' if it would actually work... it looks like the physics are all wrong.. where's the stabilisers? Wouldn't the Spartan burn their legs? On take off wouldn't the body get pushed forward at an unuseable angle? 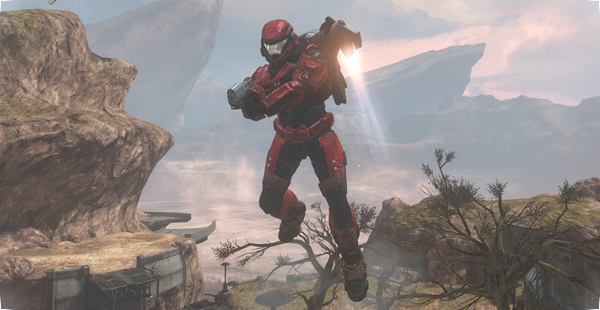 How will the Jet Pack be able to carry a Spartan armed with a fully laden rocket launcher? Oh sorry did I just go too fan boy for you? My Chris Butcher Airport Interview! How invested in Halo Reach will you get? This Bird You Cannot Change? Clans to Return in Reach? So what does Joe know about Aerospace? Grunts R Us has new digs! New Bungie Trademark - speculation abounds! Halo Reach has Sharks! Plus how Kat lost her arm! Is Marcus Lehto the Steve Jobs of Bungie? New Way into the Beta - Being a Halo 2 fan!